by Hisrich, Robert D., Peters, Michael P., Shepherd, Dean A. Comments: ALTERNATE EDITION: International Edition! Item has some cover wear but otherwise in good condition! !Used texts may not include supplemental material. 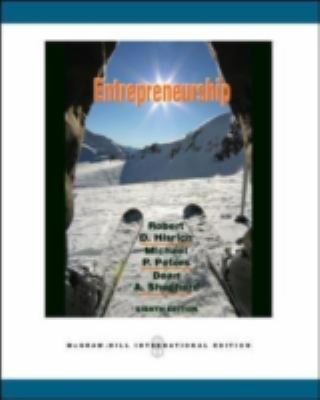 Hisrich, Robert D., Peters, Michael P., Shepherd, Dean A.
Hisrich, Robert D. is the author of 'Entrepreneurship', published 2010 under ISBN 9780071267687 and ISBN 0071267689. Loading marketplace prices 40 copies from $3.72 How does the rental process work?